The last time a team from Windham could call themselves state champions was in 2000. Last year the same basic group of kids came up short in their bid in the States. This year they took the crown. In Pool play, which determines the final four who will play for the championship, Windham split. Game one saw them perform not so well against Biddeford and lost 11-2. Game two had them back on track and they defeated Waldo 14-1. In addition to the win/loss record, runs scored are also a factor in determining the top four teams. Based on their play, they earned spot in the semi-finals and faced Old Town. Windham defeated the previously undefeated team 13-3 to advance to the championship game. As fate would have it, Windham faced off against undefeated Biddeford. Biddeford was overconfident going into the championship game. 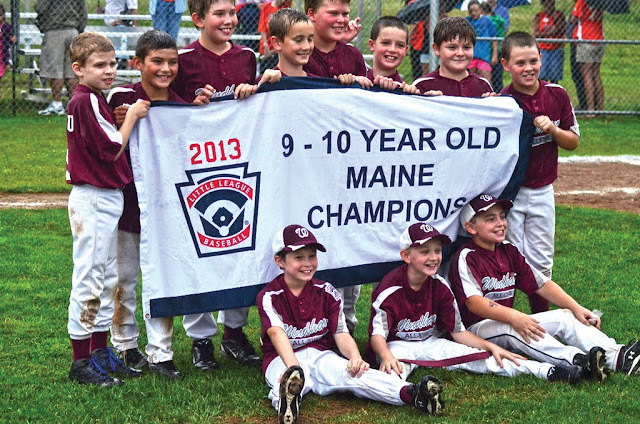 “It was the best Little League game I have ever witnessed,” said head coach Paul Kent. “Great defensive game. Too bad a team has to lose.” In the championship game, Cameron Joyce pitched the first five innings. Quinton Hastings finished the game for Windham. Despite being nervous, “Q” persevered to get the victory. Windham defeated Biddeford 1-0 in nine innings. Six innings is a regulation game. With the win, the team advances to the regional tournament. Regionals will be held Cranston, RI. Support has been tremendous for the team. The team has raised almost $7,000. This team will honored at the August 20th Sea Dogs game. They will be on the field for the National Anthem alongside the teams playing. Paul Kent is very appreciative of the support from the parents and the community for the team. Because of the support, every player will be able to attend the regional tournament in Rhode Island. Also, semifinals are Friday, August 8, with Regional Championship on Saturday, August 9. Anyone wishing to make a donation should check out the link http://www.gofundme.com/3q9hjk. Best wishes to the young team in pursuit of being a regional champion!